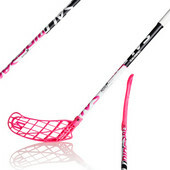 Floorball sticks specially designed for Freestyle. They are equiped with a prehooked blade - there is a hole in the front part of the blade that holds the ball. Freestyle floorball tricks are much more easier then.